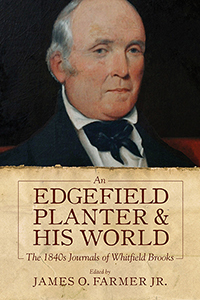 AN EDGEFIELD PLANTER AND HIS WORLD opens a window on the life of an elite family and its circle in a now iconic place, during a crystalizing decade of the Antebellum era. By the time he began a new diary volume in 1840, Brooks (1790-1851) was among the richest men in a South Carolina district known for its cotton-and-slave-generated wealth. His journal reveals Brooks’s attentiveness to his plantation and farms, self-image as a paternal master, religious sensibility, genteel but honor-bound bearing, personal and family connections, perspective on politics, and the effects of debilitating headaches. With his wife, Charleston heiress Mary Parsons Carroll, Brooks enjoyed and nurtured the social, cultural, and religious life of the village of Edgefield. While expanding his land holdings amid the vicissitudes of planter life, he promoted the developing economy of his state and region. He also participated, mostly behind the scenes, in his state’s politics, in concert with or opposition to leading public figures, some his relatives. Seeking relief from his headaches, Brooks traveled often to South Carolina’s premier Glenn Springs resort, as well as western North Carolina and Florida. While the Brookses gave priority to the futures of their five surviving children, the mercurial temperament of their first-born, future Congressman Preston Smith Brooks, was a source of anxiety as well as pride. Herein lies the unique dimension of this document--its insights into the relationship between a father and the son whose archaic sense of honor would provoke perhaps the most sensational instance of Antebellum intersectional violence, the caning of Senator Charles Sumner in 1856. The journals of Whitfield Brooks are the ‘white whale’ of Southern scholarship--a mammoth historical resource that surfaced and resurfaced without ever being seen whole, leaving historians to tell tall tales from their armchairs. James Farmer has finally caught the source in his editorial net, and it is everything we could have imagined. Here is a planter’s whole world--his dreams, decency, and struggles, not least his struggles with his disappointing son, who did more than any one man to bring on the Civil War. Farmer spent years chasing these journals, and it has all been worth it. The resulting book is a towering achievement of historical reclamation and editing. James Farmer's editing and noting unwraps the many treasures found in the journals of Whitfield Brooks, a large slaveholder and planter in South Carolina’s Edgefield district, a devout Christian who pursued many avenues for potential economic gain, often with success, and father of Congressman Preston Brooks, infamous for his caning of Charles Sumner on the floor of the United States Senate in 1856. A leading expert on pre-civil war South Carolina, Farmer provides the expertise to help readers develop an understanding of Brooks' large network of connections and he contextualizes Brooks' life with consummate skill. These are content-rich journals edited with knowledge and aplomb. James Farmer is a master of his sources and a meticulous editor, and in the daily journal of this upper-class planter he has found a treasure worthy of his talents. This insightful and perceptive journal is an open door to the lives of the planter nabobs of the antebellum South, especially since it comes to us from that crucible of Southern history that is Edgefield County, South Carolina. A welcome and important contribution to the history of South Carolina and the United States in the 1840s, the journals of Whitfield Brooks offer historians a glimpse into the world view of this vital player. These journals bring to light the essential ways in which Brooks viewed the cultural mores and religious sensibilities of his day. With remarkable depth and insight, James Farmer places the man in the context of his time. Farmer’s introduction and annotations fill in the tantalizing details of other persons of interest. This is an essential primary source for those interested in the history of this period.